It's Turbo fast with speeds up to 200 Mbps! We are proud to announce that we have made significant upgrades to our advanced fiber optic infrastructure, allowing us to provide even faster Internet service! 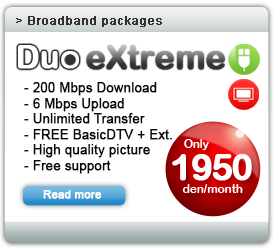 We'd like to invite you to experience the Internet in a whole new way with Multimedia Network's Internet Service! Multimedia Network Internet service provides the ultimate web experience, and since it's delivered over our Advanced Fiber Optic Network your connection is reliable. Surf, download and stream with amazingly fast download speeds. Download movies, music, photos and files in the blink of an eye. Stream the web's very best content with less waiting. It's the connection you need to power all of your Internet ready devices. (1) After reaching the limit of 150 GB monthly volume for the given month, you get free 50 GB in that month period with reduced download speed 2 Mbps / 1 Mbps. 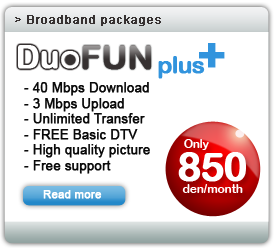 After reaching this free limit your internet speed slows down up to 768 Kbps / 512 Kbps. (2) After reaching the limit of 200 GB monthly volume for the given month, you get free 50 GB in that month period with reduced download speed 2 Mbps / 1 Mbps. 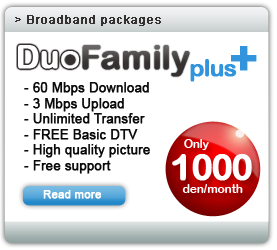 After reaching this free limit your internet speed slows down up to 768 Kbps / 512 Kbps. (3) After reaching the limit of 700 GB monthly volume for the given month, you get free 300 GB in that month period with reduced download speed 2 Mbps / 1 Mbps. After reaching this free limit your internet speed slows down up to 768 Kbps / 512 Kbps. (4) After reaching the limit of 300 GB monthly volume for the given month, you get free 100 GB in that month period with reduced download speed 2 Mbps / 1 Mbps. 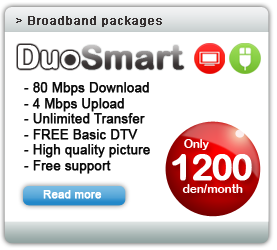 After reaching this free limit your internet speed slows down up to 768 Kbps / 512 Kbps. (5) After reaching the limit of 1000 GB monthly volume for the given month, you get free 300 GB in that month period with reduced download speed 2 Mbps / 1 Mbps. 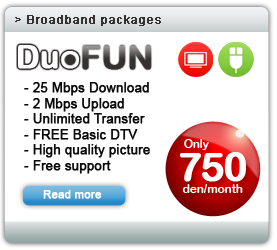 After reaching this free limit your internet speed slows down up to 768 Kbps / 512 Kbps.